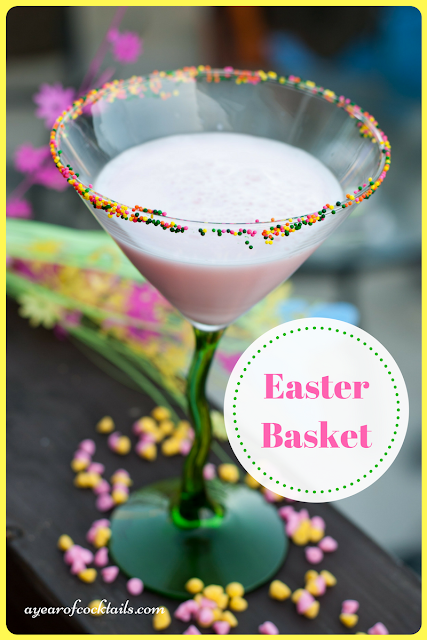 For those of you hosting Easter, are you ready? You know, it doesn't really matter what the holiday is, I just really enjoy having a reason to get the family together and eat, laugh and drink together. I really enjoy our family and we are so lucky because both my husbands and my side get together to celebrate Easter dinner together and they all genuinely really like each other. I found this cocktail at Feast Of Fun and am glad I did. I think the color of this cocktail is great and (in my mind at least) represents Easter. The only thing I would do different (which was an option on the site I found it on) would be to use half and half instead of milk.......or maybe even some cream? Otherwise I wouldn't change it. This cocktail absolutely has a cherry taste and I'm afraid the milk has masked it's full potential....which could totally be a good thing if you don't care for the cherry taste too much. In a shaker, add ice and all of the ingredients above. Shake and strain into a martini glass....which you are more then welcome to rim with sprinkles if you'd like. Here's to getting together with family and friends whether it's for a holiday, or just to do it. Perfect for Easter! Also I love grenadine, I bet this tastes great! Oooo....This Easter Basket Cocktail looks so darn scrumptious! I'm all about recipes that are festive, vibrant and colorful. I'm looking forward to serving it this weekend when the family comes over! And like you suggested, I'll definitely use cream rather than milk. Thanks so much for sharing it! That drink looks so good! We have a busy Easter this year! I hope you have a great Easter!